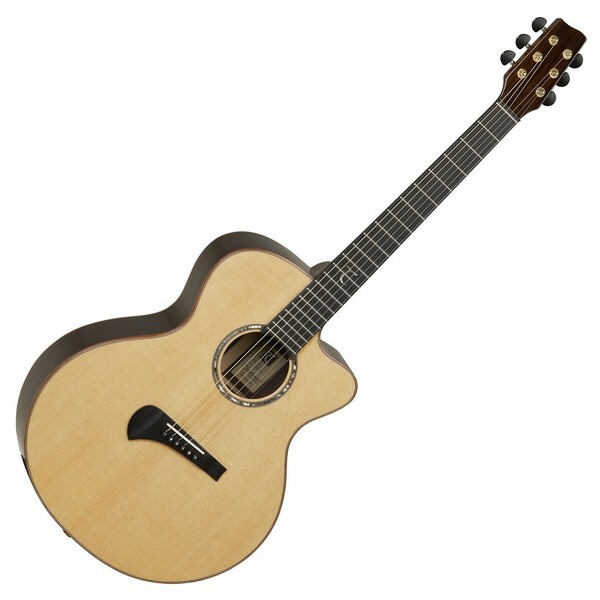 The Tanglewood TSR 2C Master Design Electro Acoustic Guitar is the collaboration of the renowned Scandinavian luthier Michael Sanden and Tanglewood. This special guitar offers a high-quality construction and design, blended with solid timbers for a superb tone and a high-end appearance. With a solid spruce and solid rosewood construction, the TSR 2C delivers a broad dynamic range, and a crisp, articulate tone blended with strong mids, a warm deep bass response and complex harmonic overtones. In addition, the TSR 2C features a grand auditorium cutaway body, and has been constructed to a precise Sanden blueprint, and incorporates Michael's stylish signature features. Its grand auditorium cutaway body is ideal for both fingerstyle and strumming players alike, offering a versatile sound that is able to handle numerous playing styles with equal ease. Furthermore its cutaway profile offers easier access to upper frets, enabling players to reach more challenging chords with ease. In addition, the TSR 2C Master Design comes equipped with a B-Band A1, providing players with a simple plug-in and play system, making it ideal for both live and rehearsal environments. Finished with delicately detailed aesthetic features, combined with Sanden's unique eye for beauty and quality construction, the Tanglewood TSR 2C Master Design is perfect for performing musicians and those needing a suitable and reliable instrument for studio recordings. Tanglewood's Instruments reflect a perfect blend between time-honoured design philosophies and modern manufacturing methodologies. Designed by some of Europe's most celebrated Luthiers, each instrument is a manifestation of some of the finest tone woods available, produced with their factories' meticulous attention to detail. Each instrument is quality checked and set-up for optimum playability, ensuring a comfortable and consistent playing experience right from the first chord strummed. The TSR 2C Master Design features a light-coloured, solid, spruce top that yields crisp articulation and delivers a broad dynamic range. Its versatile solid spruce top produces a sparkling high response and a tight, clear attack perfect for pronounced players. The TSR 2C's stunning solid top is accompanied by solid rosewood back and sides which produce a full, warm, and resonant bass response with a dark tonality that is ideal for a wide range of genres and playing styles. Together, this stunning mixture of solid timbers produces an incredibly balanced and versatile palette of tones. Constructed from mahogany, the TSR 2C's neck offers players a resonant soft warmth that responds greatly to numerous styles of play, genres and techniques, making it perfect for those with a more alternative playing style. 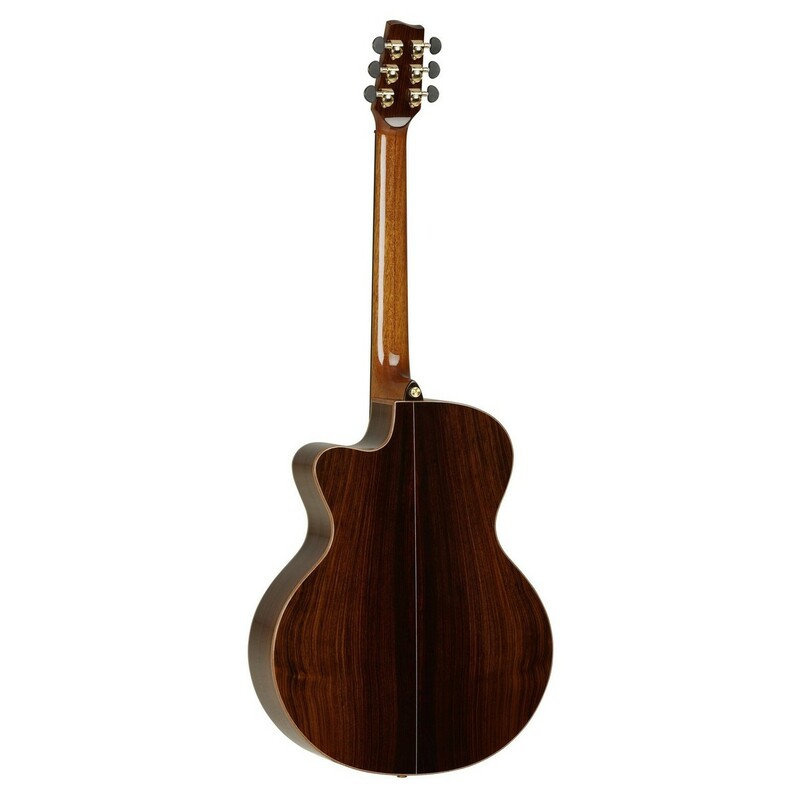 With its superb response, the mahogany neck enables players to achieve a pure, full sound with the ability to clearly hear each chord strummed, and each note picked. In addition, the TSR 2C features a twin piece neck which offers more resistance against warping, providing stability and durability. The neck is topped with a zero fret ebony fingerboard that adds a bright attack and superb sustain to the overall tone. Its zero fret fingerboard offers precise intonation by placing a fret at the headstock end of the neck, enabling the strings to sit the correct distance above other frets on the TSR 2C's fingerboard. The Tanglewood TSR 2C Master Design features a grand auditorium cutaway body, providing players with a versatile, all-purpose guitar that is well-suited to live environments, from gigs to studio settings. Its tone is full within the lower register, present within its mid-range, and sparkling on the the treble strings. In addition, its versatility makes it perfect for both fingerpicking and medium-strength strumming. Its construction, shape, and combination of timbers projects a clear and well-defined acoustic voice that sits beautifully within a live mix. Additionally, with its slightly bigger size than its smaller auditorium family member, the TSR 2C also has superb volume and projection. The TSR 2C also features a venetian cutaway profile, which is renowned for its soft, sleek, and curvaceous lines. Its cutaway profile promotes the access to upper fingerboard shredding, and provides players with a little more freedom to roam up and down the fingerboard with ease. The TSR 2C comes equipped with the B-Band A1 pickup system, offering basic sound tweaking for live and rehearsal environments. The sophisticated system is situated within the soundhole and features sleek and subtle soundhole controls for a pure and clear sound. In addition, with its built-in electronics, the TSR 2C Master Design is perfect for the performing musicians.